Old school Bay Area thrashers Exodus are taking a night off from their tour with King Diamond to play the Black Cat on Wednesday, November 18th! It’s not every day that an old school metal band plays the Black Cat so we want to help get as many of you out to this show as possible, that’s why we’re giving away a pair of tickets to this show! To enter just leave a comment on this post telling me what your favorite thrash band is. At 5pm EST this Monday, November 16th, a winner will be chosen at random (using Random.org) from all valid entries to win the tickets. Be sure to use a valid email you check regularly so I can contact you if you win. Don’t worry, I won’t add you to any spam lists or sell your info or anything sleazy like that. If I haven’t heard back from the winner in 24 hours another winner will be chosen at random. If you can’t wait to see if you win or the contest is already over when you read this, then you can get tickets from Ticket Fly for just $15 here. Exodus was one of the first bands of the infamous San Francisco thrash metal scene of the 1980’s. Long time Exodus vocalist Steve “Zetro” Souza is back in the fold and the band is currently touring in support of their first album with him in 10 years, Blood In Blood Out. Don’t expect to just hear new material though as the band will also be playing classics from their entire back catalog at the Black Cat. The opening band is a local noise band named Jail Solidarity. I know this is out third ticket give away in a row but we do have some other great posts coming up soon, including an interview with one of the members of Exodus, so stay tuned! Until then, check out these videos and let me know what your favorite thrash band is! 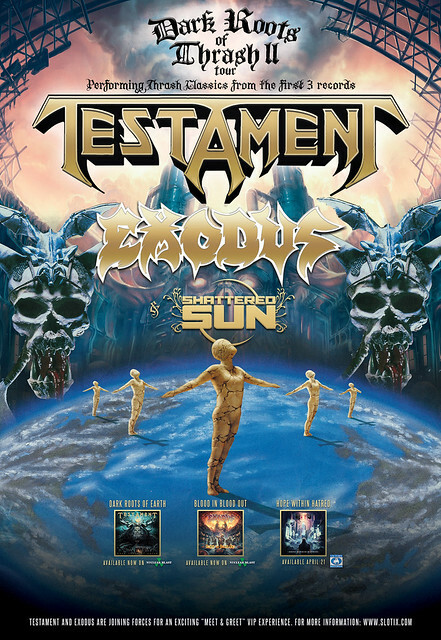 Thrash metal fans cannot miss the Dark Roots Of Thrash II Tour when it brings both Testament and Exodus to the Fillmore Silver Spring on Tuesday, April 28th of 2015! We’re so psyched that we want to get as many people out to this show as possible so this week we’re giving away a free pair of tickets to one of you lucky DCHM readers. To enter just leave a comment on this post telling me what your favorite thrash metal band is. You can go old school Bay Area like Testament and Exodus themselves, or Big Four like Anthrax and Slayer, or maybe new school like Municipal Waste and Warbringer or even go with a crossover band for you DRI and Power Trip fans! At 5pm EST this Friday, April 24th, a winner will be chosen at random (using Random.org) from all valid entries to win the tickets. Be sure to enter using a valid email you check regularly so I can contact you if you win. Don’t worry, I won’t add you to any spam lists or sell your info or anything sleazy like that. If I haven’t heard back from the winner within 24 hours another winner will be chosen at random. If you can’t wait to see if you win or the contest is already over when you read this, then you can get tickets from Live Nation for $35.50 here. 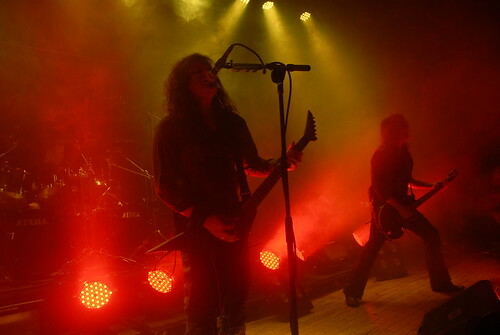 On this tour Testament will be playing a set mostly consisting of material from their first three albums, The Legacy, The New Order and Practice What You Preach, so fans of the band’s classic older material are in for a hell of a show. And you may have heard that Exodus has brought back Steve Souza to front the band so you can expect to hear songs from their new album with him, Blood In Blood Out, as well as classic older material from when he was with the band in the 80s and 90s. The opening act for this show is going to be Shattered Sun, a Texas based band that is having their debut full length album, Hope Within Hatred, released this very week on Victory Records. Now to get you in the headbanging, crowd surfing, mosh pit shoving mood check out these videos by each band below and tell me what your favorite thrash metal band is in the comments! One of the original grind bands is teaming up with one of the original Canadian thrash bands when Napalm Death and Voivod join forces for the Through Space And Grind Tour! The tour’s only stop in our area is on Saturday, January 31st at the Baltimore SoundStage and because this show is going to be so sick we’re going to give away a pair of tickets to one of you loyal DCHM readers! To enter just leave a comment on this post telling me which band on the tour you want to see the most (choose from Napalm Death, Voivod, Exhumed, Iron Reagan, Black Crown Initiate or Ringworm). At 5pm EST on Wednesday, January 28th, a winner will be chosen at random (using Random.org) from all valid entries to win the tickets. Be sure to enter using a valid email you check regularly so I can contact you if you win. Don’t worry, I won’t add you to any spam lists or sell your info or anything sleazy like that. If I haven’t heard back from the winner in 24 hours another winner will be chosen at random. If you can’t wait to see if you win or the contest is already over when you read this, then you can get tickets from Ticket Fly for $18.70 here. 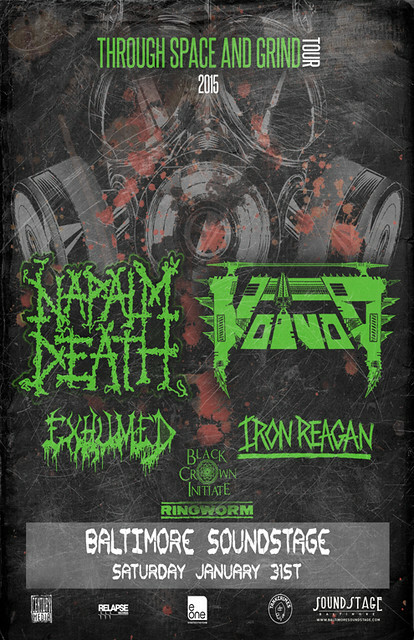 UK grind gods Napalm Death always put on a great live show and Voivod haven’t played the area since they played Maryland Deathfest in 2011! 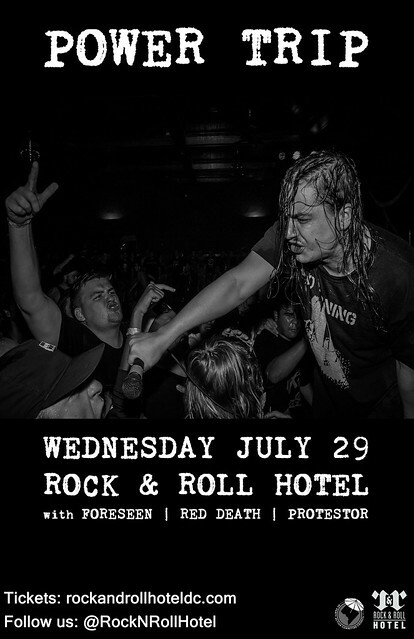 In addition there will be sets by the Carcass inspired gorey death meta band Exhumed and crossover thrash by Richmond’s Iron Reagan, a wild band featuring the vocalist and bass player of Municipal Waste! Black Crown Initiate will be playing their proggy death metal and Cleveland based thrash-core band Ringworm will get the mosh pits started early! You’ve got to admit that’s a hell of a line up,l and for under $20 too! Now check out these videos by the bands on the bill and let me know which band you’re most excited to see on the 31st at the Baltimore SoundStage! 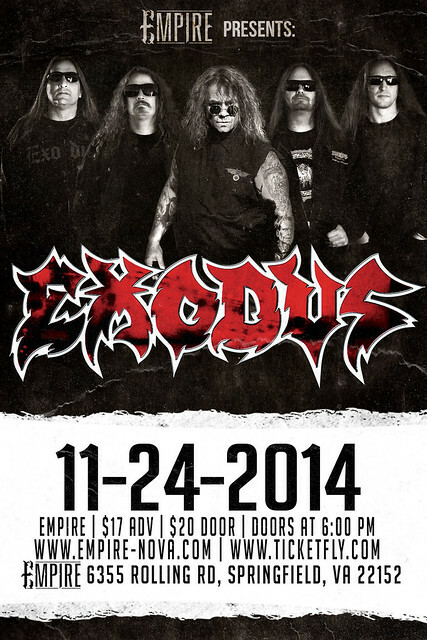 One of the original Bay Area thrash bands from the 80s, Exodus, is coming the Empire on Monday, November 24th for the band’s first area appearance with returning vocalist Steve Souza fronting the band. 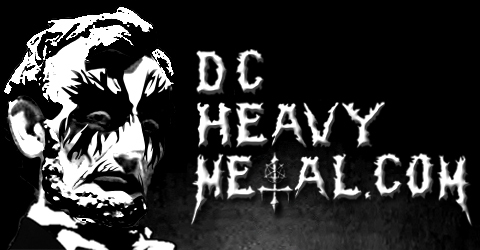 We here at DCHeavyMetal.com couldn’t be more excited so we’re giving away a free pair of tickets to one of you lucky DCHM readers. To enter just leave a comment on this post telling me which Exodus song you want to hear the most (if you need help you can find their discography here) when they come to Empire on Monday. At 5pm EST this Friday, November 21st, a winner will be chosen at random (using Random.org) from all valid entries to win the tickets. Be sure to enter using a valid email you check regularly so I can contact you if you win. Don’t worry, I won’t add you to any spam lists or sell your info or anything sleazy like that. If I haven’t heard back from the winner in 24 hours another winner will be chosen at random. If you can’t wait to see if you win or the contest is already over when you read this, then you can get tickets from Ticket Fly for $17 here. Steve Souza fronted Exodus for the band’s four albums from 1987 to 1992, and then again for their 2004 return album Tempo Of The Damned. Now he finds himself back in Exodus with the release of their new album, Blood In, Blood Out, and fans and critics alike are raving about it. Exodus fan’s won’t want to miss the band’s only area appearance this year with Souza back to perform those classic songs with them. Exodus is currently touring with Slayer and Suicidal Tendencies this show is an off date of that tour, which unfortunately isn’t coming anywhere near us. As such there’s isn’t any touring support, however we will get sets by some great locals including Yesterday’s Saints, March To Victory, Oberris, Blunt Force Rebellion, Afarinesh, and Red Sky Research. 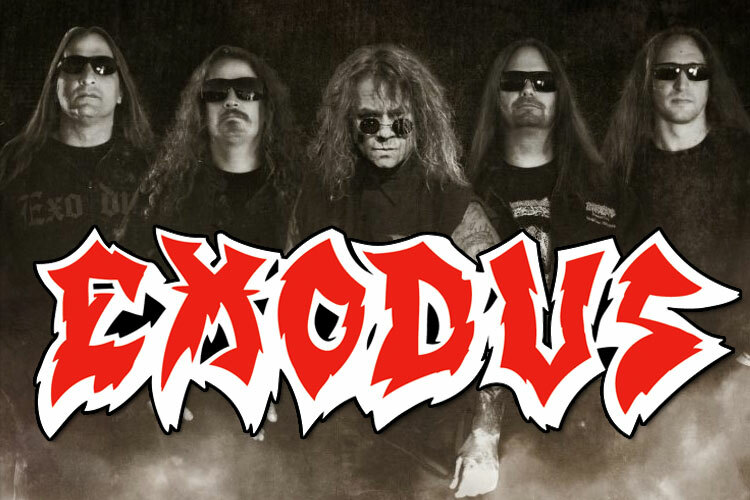 So check out these awesome Exodus videos below, tell me which song you want to hear them play the most on Monday, and get ready for a killer night of thrash! Thursday of last week, October 23rd, I headed up to the Baltimore SoundStage in, you guessed it, Baltimore, Maryland to catch Arch Enemy and Kreator. Starkill and Huntress also opened the show, but I couldn’t get up there in time to see them. 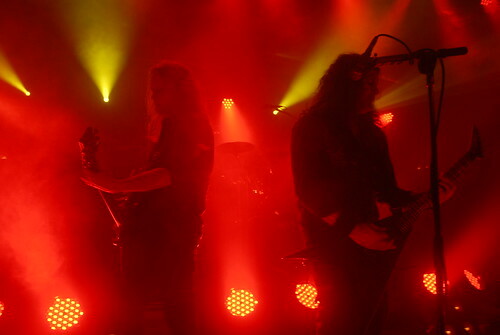 In fact, German thrashers Kreator were already two songs into their set when I walked in. I did get a few shots during their third song though. 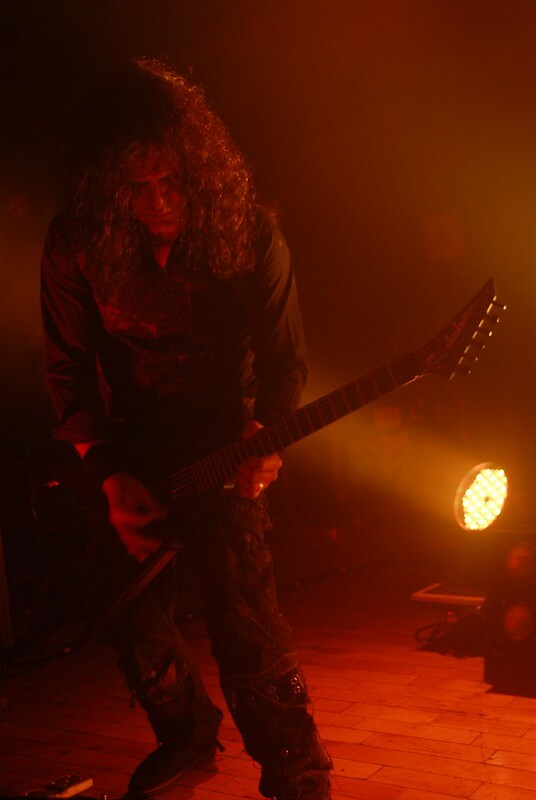 Their set wasn’t bad, pretty typical for Kreator really. A mix of older classics with more popular modern songs thrown in. They had a ton of fog up there and their light show was very bright as usual. I ended up buying a Kreator bottle opener but the merch girl didn’t give me any change back so I ended up paying $10 for something that should have cost $3. After arguing with her about it for a few minutes (and failing to get my change back) the negative experience took me out of their show. They didn’t play their song “Flag Of Hate” either, which was a bummer, but otherwise the set was good overall. 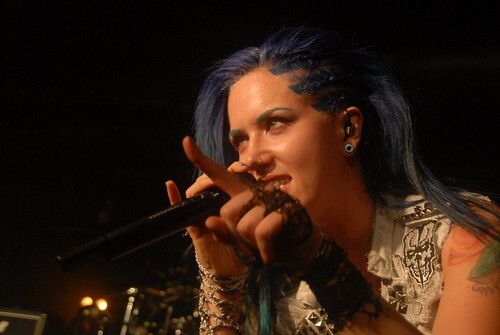 Next up was Arch Enemy. 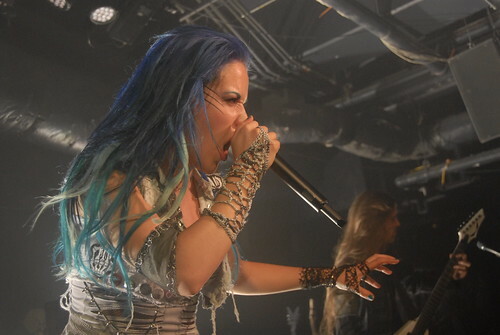 This was the Swedish death metal band’s first US tour with new vocalist Alissa White-Gluz fronting the band, and not only that, the Baltimore show was the first date of the tour. I wasn’t sure what to expect, the band’s previous vocalist, Angela Gossow, left some pretty big shoes to fill. 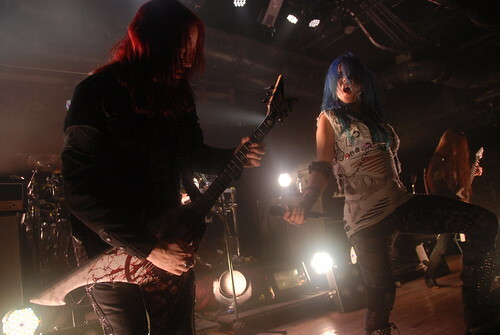 Arch Enemy was around before Angela joined in 2000, but they really rose to prominence once she joined the band. She was one of the first women to front any kind of death metal band, and she wasn’t just up there as eye candy either, she was really good at it. She could growl and had great stage presence and it earned the band many fans over the years. 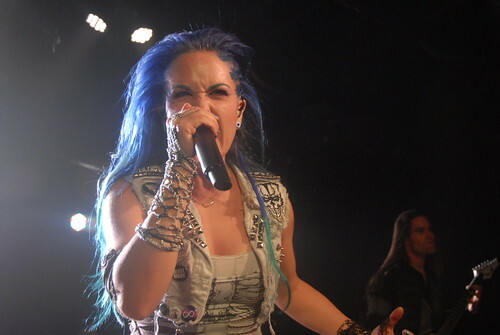 I didn’t love Alissa’s performance on the new Arch Enemy record, War Eternal, her voice seemed very flat and digitally tinkered with in the studio. However this night she really was incredible live. She had excellent stage presence and great energy, fans reacted immediately to her charisma, and her voice held up really well throughout the entire set. 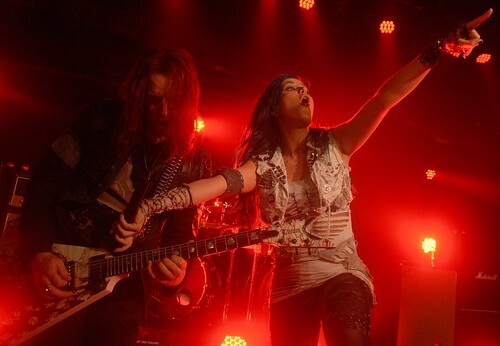 While she is certainly the main focus while the band is on stage she still made sure to step back and let guitarists Michael Amott (of Carcass fame) and Nick Cordle (a Virginia native) draw the audience’s attention from time to time. 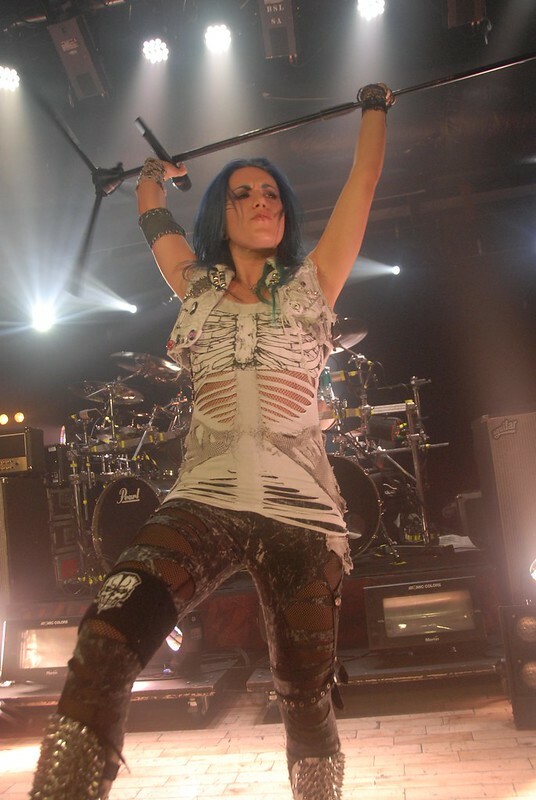 You could tell she had studied old Arch Enemy live footage as she used many of the same moves that Angela did, but Alissa had plenty of her own too. It was really fun photographing her not only because of her model-like looks but because she was always doing something on stage and I never felt like I was getting the same shot twice. The one thing I really didn’t enjoy much was when she instructed the audience to start pogo hopping in place, something you usually see at a pop punk show, not a metal show. 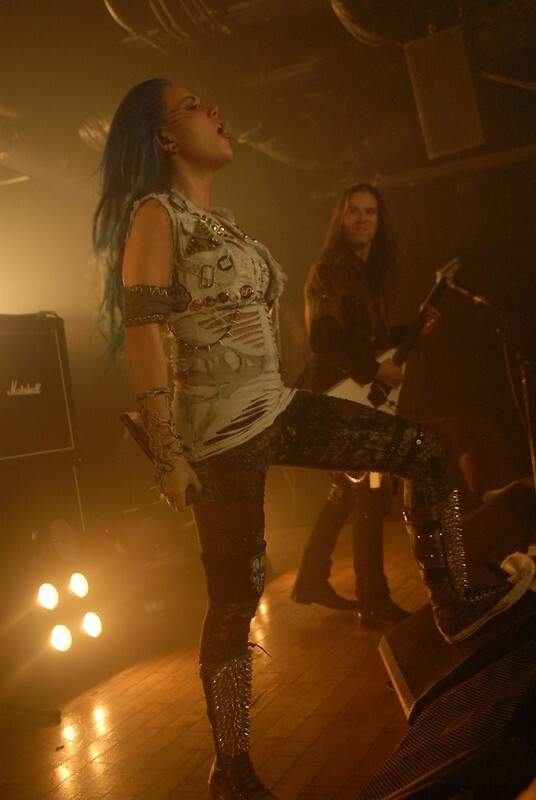 I have to admit I was impressed overall though, and I think Arch Enemy fans are going to love seeing Alissa front the band for some time. Below are some of my photos from the show. You can see these photos much larger, and many I didn’t even use here including both bands’ set lists, on Flickr by going here. Maryland Deathfest XII starts next week! Our annual Maryland Deathfest Survival Guide will be up soon but leading up to the big post we’ve put together some reviews of albums by some of the less well known bands playing Deathfest this year that you will not want to miss seeing live. These posts have a lot of background on the bands to help you become an expert on them before you see them, and of course there’s a few songs at the end of the post that you can stream to get acquainted with the bands too. This is our fourth and final review but we’ve covered at least one band playing each day on the big outdoor Edison Lot stages (the main festival stages that will not sell out). You can check out the rest of our MDF XII coverage here but until then take a few minutes to learn why you shouldn’t miss Sarke if you’re at Deathfest on Saturday. If you’ve heard only one thing about the Norwegian band Sarke you’ve probably heard that the band features Nocturno Culto of Darkthrone on vocals. This is true and since Darkthrone refuses to play live shows seeing Sarke at Maryland Deathfest is a rare chance to see one of Darkthrone’s two members in a live setting. What most people don’t know about Sarke though is that the band is actually the solo project of a guy named Sarke (his real name is Thomas Berglie). Sarke, the musician, is best known for being the drummer of Khold though he’s also the drummer for the (very underrated) black metal band Tulus. 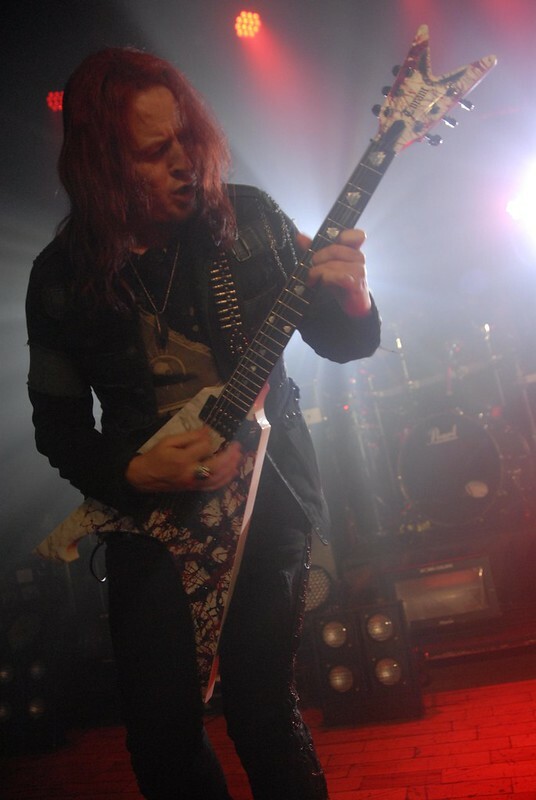 On the first Sarke album, Vorunah, he played all instruments aside from the vocals that Nocturno Culto recorded. 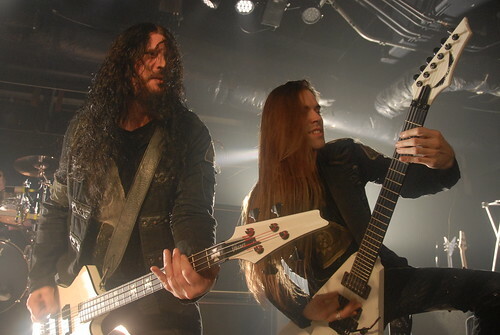 These days Sarke only plays bass and has brought in other musicians to fill out the band’s line up, though he continues to write all of the band’s lyrics as well. While not as big of names as Nocturno Culto, the other members come from bands like Borknagar, Ihsahn and Lunaris, so the band as a whole has quite the resume. As far as Sarke’s actual sound goes, they’re often described as black/thrash metal but that’s a bit off as they don’t sound much like the standard bands of that style such as Aura Noir or Absu. Sarke is slower than most thrash bands and sound something akin to older bands like Venom, Motörhead and Celtic Frost combined with a primitive style of early 90’s Norwegian black metal. 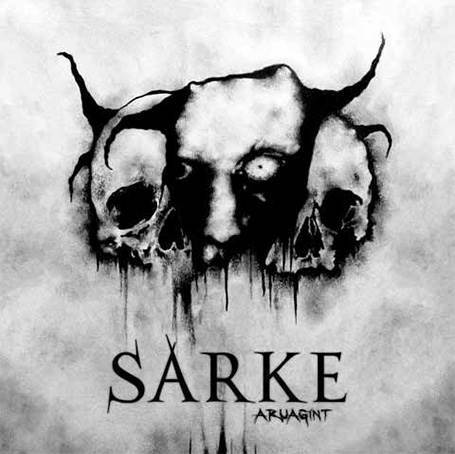 The first two Sarke albums are a bit more thrashy than Aruagint but what their latest album lacks in overall speed it makes up for in coldness. This sense of coldness isn’t just the chill of the Norwegian winds that permeates their sound but also emotional coldness, neither happy nor sad, just empty. We’ve gotten this sense of cold from many straight up black metal bands over the years but Sarke is different, they have a certain groove to their sound. Calm and calculated they often raise the tempo to breathe life into a song when it is needed, such as on the track “Icon Usurper” where they use this technique perfectly. The band does a good job of keeping a sense of tension throughout the album and Nocturno Culto’s voice has no major effects done to it. The recording itself has the band sounding good without being overproduced. You can hear each instrument distinctly and the keyboards are in the background where they should be, but you’ll find no flashy studio tricks here. The song “Ugly” with its chorus line of “Cause I’m ugly/Ugly as Hell” and punkish main riff brings a bit of that dark punk vibe that Darkthrone has been doing lately and Nocturno Culto seems perfect for this song in particular. Sarke isn’t the most technical band by any means but they do come up with some pretty fun grooves, combined with that sense of coldness, that makes it just plain fun to listen to them jam. Their songs are well thought out though and every note sounds like it is right where it should be. Their studio sound comes across as very rehearsed so I’m guessing they’ll be pretty tight when they play Deathfest. 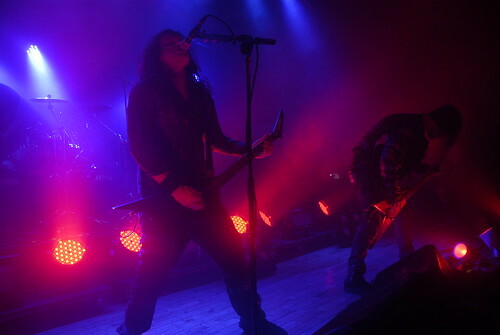 It will be interesting to see what kind of performance they put on live as Nocturno Culto doesn’t appear to be a very wild front man in most of the live footage I’ve seen of them, however he does seem to get more energy from the crowd depending on how energetic they are. This will be Sarke’s first ever live performance in the US so let’s hope everyone is as psyched to see them on Saturday as I am. Be sure to check out the following songs from Aruagint and start getting psyched for Maryland Deathfest XII next week!